Hippolyte De La Roche (17 July 1797 – 4 November 1856), commonly known as Paul Delaroche, was a French painter. He was born and died in Paris. Delaroche was trained by Antoine-Jean, Baron Gros, who then painted life-size histories and had many students. He is known for such sensational historical paintings as The Execution of Lady Jane Grey. The first Delaroche picture exhibited was the large Jehosheba saving Joash (1822). This exhibition led to his acquaintance with Théodore Géricault and Eugène Delacroix, with whom he became friends. The three of them formed the core of a large group of Parisian historical painters. He visited Italy in 1838 and 1843, when his father-in-law, Horace Vernet, was director of the French Academy in Rome. Delaroche's studio in Paris was in the Rue Mazarine. His subjects were painted with a firm, solid, smooth surface, which gave an appearance of the highest finish. This texture was the manner of the day and was also found in the works of Vernet, Ary Scheffer, Louis Léopold Robert and Jean Auguste Dominique Ingres. Among his students were British landscape artist Henry Mark Anthony (1817–1886), British history painters Edward Armitage RA (1817–1896) and Charles Lucy (1814–1873), and American painter/photographer Alfred L. Boisseau (1823–1901). Delaroche's paintings, with their straightforward technique and dramatic compositions, became very popular. 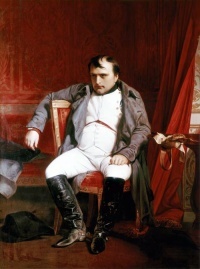 He applied essentially the same treatment to the characters of distant historical times, the founders of Christianity, and various figures of his own day such as "Napoleon at Fontainebleau," "Napoleon at St Helena," or "Marie Antoinette leaving the Convention after her sentence." His dramatic paintings include Strafford Led to Execution, depicting the English Archbishop Laud stretching his arms out of the small high window of his cell to bless Thomas Wentworth, 1st Earl of Strafford, as Strafford passes along the corridor to be executed, and the Assassination of the duc de Guise at Blois. Another famous work shows Cardinal Richelieu in a gorgeous barge, preceding the boat carrying Cinq-Mars and De Thou carried to their execution. Other important Delaroche works include The Princes in the Tower and the La Jeune Martyre (showing a young female martyr floating dead on the Tiber). Delaroche's work sometimes contained historical inaccuracies. Cromwell lifting the Coffin-lid and looking at the Body of Charles is based on an urban legend, and The Execution of Lady Jane Grey is represented as taking place in a dungeon, which is badly inaccurate. He tended to care more about dramatic effect than historical truth: see also The King in the Guardroom, where villainous Puritan soldiers blow tobacco smoke in the face of King Charles, and Queen Elizabeth Dying on the Ground. Delaroche's love for Horace Vernet's daughter Louise was the absorbing passion of his life. He married Loiuse in 1835, in which year he also exhibited Head of an Angel, which was based on a study of her. It is said that Delaroche never recovered from the shock of her 1845 death at the age of 31. After her loss he produced a sequence of small elaborate pictures of incidents in Jesus' Passion. He focused attention on the human drama of the Passion, as in a painting where Mary and the apostles hear the crowd cheering Jesus on the Via Dolorosa, and another where St. John escorts Mary home after her son's death. In 1837 Delaroche received the commission for the great picture that came to be known as the Hémicycle, a Raphaelesque tableau influenced by The School of Athens. This was a 27 metres (88.5 ft) long, mural in the hemicycle of the award theatre of the École des Beaux Arts. The commission came from the École's architect, Félix Duban. The painting represents seventy-five great artists of all ages, in conversation, assembled in groups on either hand of a central elevation of white marble steps, on the topmost of which are three thrones filled by the creators of the Parthenon: architect Phidias, sculptor Ictinus, and painter Apelles, symbolizing the unity of these arts. To supply the female element in this vast composition he introduced the genii or muses, who symbolize or reign over the arts, leaning against the balustrade of the steps, depicted as idealized female figures. The painting is done directly on the wall, in oil paints. Delaroche finished the work in 1841, but it was considerably damaged by a fire in 1855. He immediately set about trying to re-paint and restore the work, but died on 4 November 1856, before he had accomplished much of this. The restoration was finished by Joseph-Nicolas Robert-Fleury. Delaroche is often quoted as saying 'from today, painting is dead'. The observation was probably made in 1839, when Delaroche saw the Daguerreotype (the first successful photographic process). Unless indicated otherwise, the text in this article is either based on Wikipedia article "Paul Delaroche" or another language Wikipedia page thereof used under the terms of the GNU Free Documentation License; or on original research by Jahsonic and friends. See Art and Popular Culture's copyright notice. This page was last modified 09:38, 25 September 2013. This page has been accessed 3,847 times.